Among the applications updated in Adobe’s Creative Suite 4 is Illustrator, the company’s oldest software application. 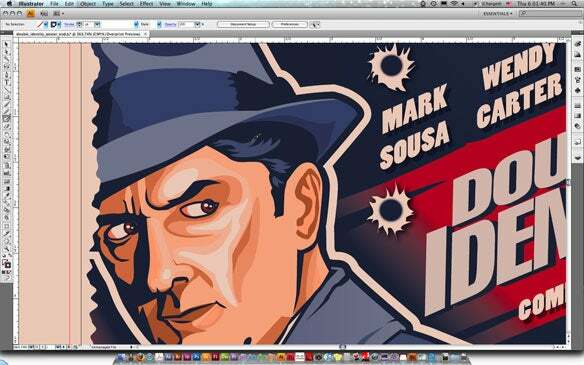 While a lot of effort was put into further integration between Illustrator and the other CS4 apps, Adobe also focused on several new features for the latest version of its illustration application. Among those additions is the ability to have multiple artboards. This allows designers to have work areas of varying sizes, all within the same document. That eliminates the need for page tiling. You can arrange up to 100 artboards any way you want—tiled, overlapping or freeform. Artboards can be exports as a single multipage PDF or as a series of numbered pages. Illustrator CS4 also introduces transparency in gradients. Because of Illustrator’s integration with other CS4 apps, any transparency in gradients that you make in the drawing application can also be used in Photoshop Extended, Flash Professional, InDesign, and Fireworks. David Macy, Illustrator’s senior product manager, describes the new Blob Brush tool as “a new way to do vector painting.” The Blob Brush allows you to sketch objects without worrying about overlaps—it will merge your paths into a single selectable object. The new Blob Brush tool in Illustrator CS4 merges paths into a single selectable object, letting users sketch away. Adobe says it improved the isolation mode hin this release, adding support for more object types including compound paths, gradient mesh objects, images, and clipping masks. This mode also features selectable breadcrumbs, so you can easily see an icon in the breadcrumb trail of what you are working on. Icons in the breadcrumb trail represent the Layer, Group, Symbol, Path, or Image. Designers now have the ability to edit object characteristics from within the Appearance panel. The new panel shows attributes for single and multiple objects—such as fill or stroke color—that can be edited by clicking on the attribute. Illustratos can even make edits that are shared among objects. Illustrator has a new option called Same Appearance that will allow you to choose objects in your artwork that have certain attributes in common. With similar objects selected, you can edit attributes of the objects from the Appearance panel all at once. Adobe Illustrator CS4 will ship in October for $599. Owners of Illustrator CS3, Illustrator CS2, or Illustrator CS can upgrade to Adobe Illustrator CS4 for $199. Adobe is also offering owners of FreeHand 9, 10, or MX, and owners of CorelDRAW an option to purchase Illustrator. Those users can switch to Illustrator CS4 for $199. Illustrator is part of the Creative Suite 4 Design Premium ($1799), Web Premium ($1699), Production Premium ($1699), and the Creative Suite 4 Master Collection ($2499).